Arab American Caucus "most progressive caucus within the Democratic Party"
Delegates expressed shock over learning of a more frightening double standard regarding Senate (S 462) and House (HR 938) — resolutions that would result in Israeli citizens obtaining what no other citizens of the world have: the right to enter the United States without visas without reciprocity. What if Mexicans or Russians or Iranians demanded equal rights with the Israelis? There was a feeling of betrayal when a list of Democrats who had signed onto the measure was read. Democrats have previously expressed strong anger over the monetary ties between AIPAC (America Israeli Political Action Committee) and elected Democrats who have run on platforms of peace and voted for war, leaving their supporters feeling betrayed. Were any CDP members thinking of the Mossad’s attack on the King David Hotel as throughout the meeting of the Arab-American Caucus, the caucus continued to be disrupted while the following warning was broadcast throughout the Hilton? The list of officers of Arab-American Caucus helps to dispel certain false claims regarding the Arab culture. Rather than being treated as second class citizens, women appeared to be running the caucus. The chairman is Sarah Moussa, a public relations expert for Gilvy and the Treasurer is Fatimah Dadabhoy, a civil rights attorney. Watching these women, it is clear that they are not being bossed around by men but are very independent, powerful women. 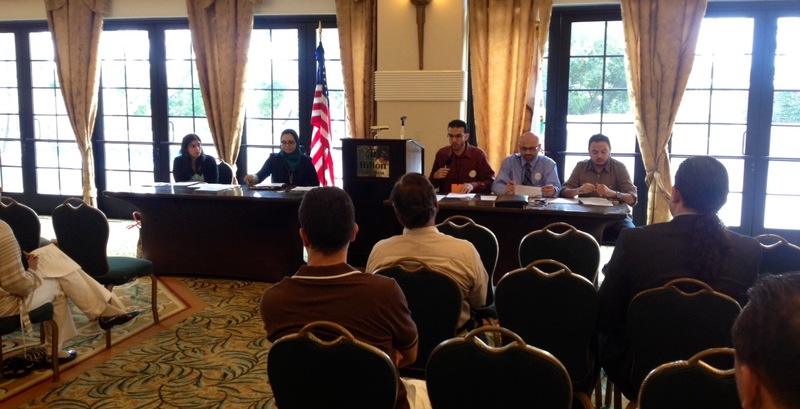 The Arab-American Caucus is perhaps the most progressive caucus within the Democratic Party. This writer helped found and was the master of ceremonies at the opening of the Progressive Caucus and has seen that caucus teeter between progressive and regressive, frequently falling behind the Arab-American and African-American caucuses in standing up for human rights.